Add an ergonomic adjustable keyboard shelf to any table or desk, in minutes. Commercial grade, 100% made of steel & MDF wood. 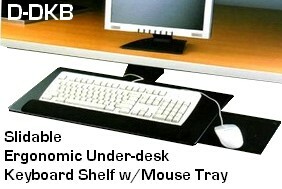 Includes a mouse tray platform, which can slide either to the left or right. Can be stowed back under the desk. 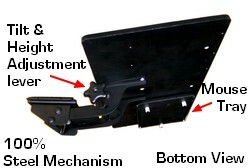 The tilt is adjustable, as well as the height. 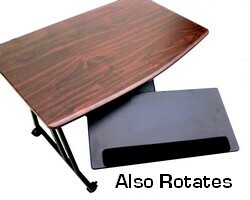 The keyboard platform can also rotate at an angle. The image above shows its ample adjustment possibilities: from simply pulled-out straight to tilted, elevated, flush horizontal with the tabletop, and even above the tabletop. The position then can be stiffened or directly locked by turning the knob clockwise. The keyboard tray dimensions allow fitting most of the keyboards available in the market. It can also be used to place a small laptop. The tray includes an ergonomic gel wrist-pad, attached to the surface, which also prevents the keyboard from slipping off. 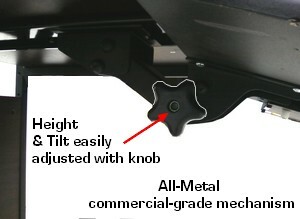 As shown above, the keyboard tray's "rotating" movement allows it to be aimed to the sides, a convenient feature if installing the keyboard shelf towards the side of a long desk or table, or for custom installations. This keyboard platform is made of 100% steel and will prove to be a very reliable and comfortable work aid for years. The installation is very simple: the above tray and mechanism combo simply slides into a metal rail that is attached to the bottom of your table or desk. All hardware is included to ensure a quick installation.